Whisk flour, salt and baking powder together. Set aside. Beat butter and sugar together until light and fluffy. Add egg and stir to combine. Stir in vanilla. Stir in flour mixture just until combined. Crush toffee bits to fine crumbs, either using a food processor or by placing in a bag and smashing with a rolling pin. Stir toffee bits into cookie dough. Scoop out 18 pieces of cookie dough; flatten into irregular shaped cookies that resemble rocks. Set cookies on parchment paper-lined baking sheets. 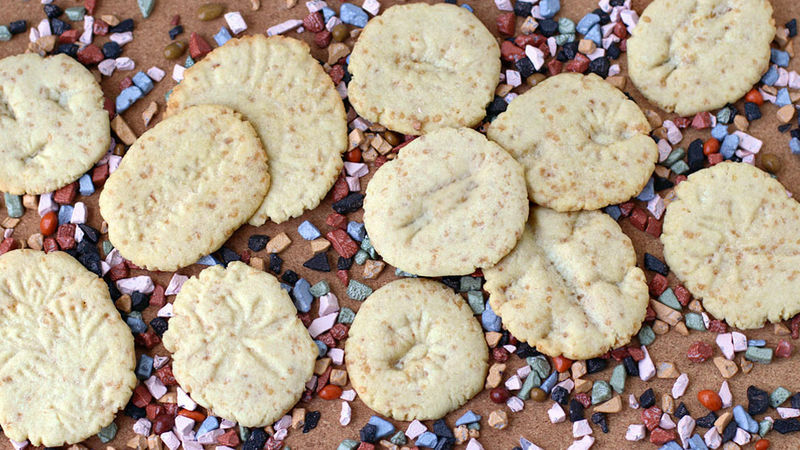 Either set a piece of plastic wrap over a cookie and imprint using plastic bugs, shells, or leaves, or dust a fossil impression mat lightly with flour and rub it over the cookies. Freeze cookies for 15-30 minutes. Bake cookies for 12-14 minutes, until lightly golden brown around the edges.